Click here to read about the unusual origins on the Bradford club and how it progressed from Rugby Union to Rugby League and finally to association football. Bradford FC’s pioneering association section lasted for just four seasons. Click on the links below to see how the team got on. 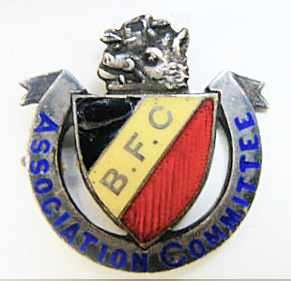 This badge is one of the very few surviving pieces of memorabilia from Bradford’s first football club, the association section of Bradford FC. The piece was made by the jewellers Fattorini of Bradford and has the name W.J. Byard and the dates 1897/98 engraved on the back. The badge is so rare that it raised £658 when sold on ebay shortly after the launch of this site in 2011.